Snakes and diamonds! The wild and edgy Tag Heuer WW2116.FC6217 Monaco Automatic Unisex Watch will elicit double-takes with its distinctive chocolate-hued dial and dramatic python leather strap. This substantial his-or-hers wristwatch makes a bold statement of adventure and individuality, perhaps not intended for the faint of heart. The sultry bronze PVD is set with 13 Top Wesselton diamonds on a robust brushed and polished square steel case shielded with a convex scratch-resistant sapphire crystal and surrounded with a stationary bezel. The Tag Heuer WW2116.FC6217 Monaco Automatic Unisex Watch features silver-tone hour markers and luminescent nickel-plated hands for superb legibility. The date window is set at the 3 o’clock position and a square seconds sub-dial is situated at 6 o’clock. The dial also displays the monochrome Tag Heuer logo and inscription. The case back is transparent with an exhibition crystal, and the striking python band features a push-button folding clasp. Water-resistant to 165 feet (50 meters), it is suitable for showering but not recommended for swimming. Powered by Tag Heuer caliber 6 Swiss automatic self-winding movement, the Tag Heuer WW2116.FC6217 Monaco Automatic Unisex Watch is an extraordinary timepiece befitting the untamed, intrepid woman or man. 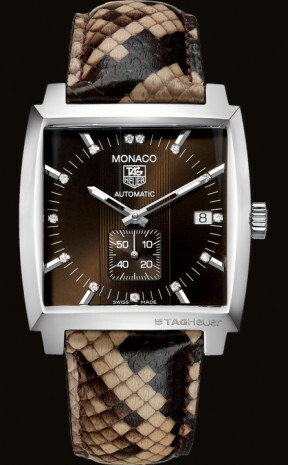 It is available at authorized Tag Heuer retailers.